Every giving heart shall plant a seed of love, which will grow and give back to the needy. Based on this belief, Accton Technology Corporation founded Accton Cultural & Educational Foundation in 1999. Accton has committed to care for this beloved place where we established our company and the people who need help. Together with local communities’ loving participation, we hope to bring heaven on earth. Explore some of Accton’s charity works below. 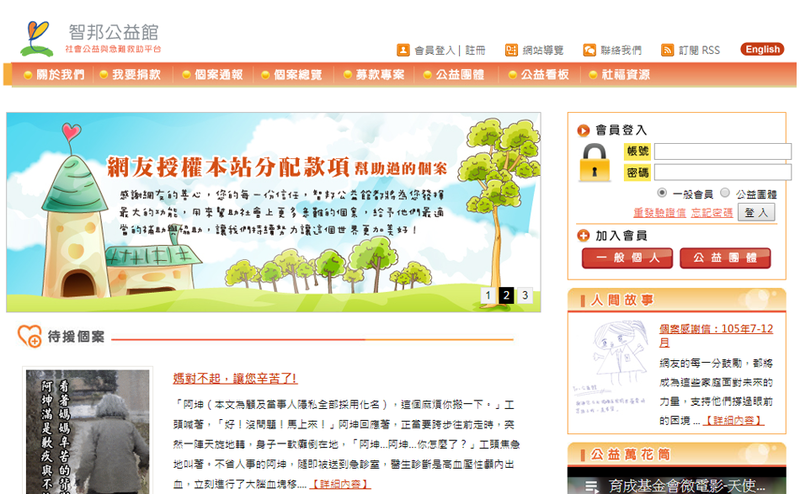 Based on the idea of donation-direct help, the Accton E-Charity website, www.17885.com.tw, was created with Accton’s networking expertise in 2001. The E-platform enables people to directly donate to families and individuals with personal emergency assistance in their time of need. 1.Subsidies: When a breadwinner is unable to support his or her family due to an emergency, a severe illness, or a natural disaster. 2.Medical Aid: Subsidies for individuals living with severe illness or injury, where treatment is unaffordable to the individuals or their caretakers, and such treatment is not covered by the benefit package of the national health insurance or labor insurance. 3.Funeral Assistance: For people from low-income families who are unable to afford funeral expenses. 4.Disaster Relief: Subsidies for families that are affected in the short term by a serious natural or human-made disaster that has caused economic damage. Accton provides a free platform that enables people to make direct donations to trusted charity groups online, as well as to report emergency cases of individuals who need immediate assistance. In 2017, Accton E-Charity has assisted 212 families in need with NTD $2,929,500. We have accompanied more than 2000 families through their darkest periods since being established. We will continue our work to bring hope and laughter into others’ lives. Accton E-Charity website is also a platform for other charity organizations to broadcast the necessities and human resources they need, or to fundraise through our website, so that their pleas can reach to enterprises and the public. These services are provided free of charge. Up to 2017, we have 312 charity group members and 300 thousand individual members. Together we can help the underprivileged communities through various ways. 1.Cabbages: All profits went to the rural farmers. 2.Orange Sale I: For every box of oranges sold, farmers donated NTD $120 to children from low-income families. 3.Orange sale II: Sold 9000 kilograms of oranges and all profits went to the farmers and underprivileged communities. 4.Jujube: For every box of jujubes sold, the farmers donated NTD $100 to local low-income families. Mother Teresa said “To keep a lamp burning, we have to keep putting oil in it.” Accton Cultural & Educational Foundation has always been committed to caring for children from low-income families in various ways, including scholarships for the Department of Special Education, National Hsinchu University Education; provided glasses for children with special needs; hosted summer camps for new immigrant families’ children; sponsored breakfast for elementary school students; recruited volunteers to draw for a children’s picture book; provided online distance tutoring for new immigrants’ children in Pingtung, etc. Accton Cultural & Educational Foundation and Hotel Royal Hsinchu have co-hosted the Christmas Make-A-Wish event for 14 years since 2003. Every year before Christmas, we invite over 20 companies in Hsinchu Science Park to fulfil wishes of underprivileged children in the local area by purchasing presents they selected and delivering to them. In 2017, Accton has gathered 22 companies and raised 2811 Christmas presents. So far, more than 20,000 children’s wishes have been fulfilled. In Hsinchu city, over a thousand children are near poor but do not qualify for government subsidies. Accton has encouraged its staff to sponsor breakfast for more than 600 of these children since 2014. In 2017 we sponsored 49,273 breakfasts for 150 children. We hope by providing a healthy breakfast every day, they will be able to focus on their studies and create a better future for themselves. For 15 years Accton has collaborated with Taiwan Fund for Children and Families – Hsinchu branch, and offered Hope Scholarships to rural underprivileged youth in Wufeng and Jianshi Junior High Schools. Over 2,000 scholarships have been awarded up to 2017. These scholarships are not limited to students who excel in academic performance, but also those who are just hardworking. By awarding these students, they can continue schooling and eventually improve their lives through education.